A cyclist pedals to exert a torque on the rear wheel of the bicycle. When the cyclist changes to a higher gear, the torque increases. Which of the following would be the most effective strategy to help you determine the change in angular momentum of the bicycle wheel? This is College Physics Answers with Shaun Dychko. We're going to find the change in the angular momentum of the bicycle wheel after the gears are changed. So we have l prime minus l is what we have to find. We have the moment of inertia of the bicycle wheel system multiplied by the final angular velocity minus the moment of inertia of the system times its initial angular velocity. Now the moment of inertia of the system doesn't change with changes in the position of the chain. So we can factor out this i, it's a common factor. It doesn't need a subscript and it doesn't need a prime here. So we have i times omega prime minus omega. So we should find an expression for omega prime in terms of torque then. We know that it equals the initial angular velocity plus the angular acceleration multiplied by time and we can substitute for alpha with the net torque divided by the moment of inertia. So we can then substitute this in for omega prime and we do that here. We see that the omega initial makes zero because it's omega minus omega, and then the term that's left over is this. 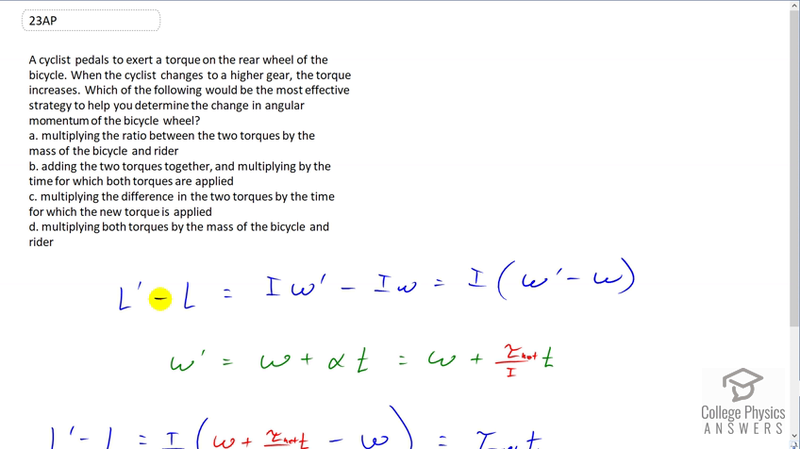 The moment of inertia on the bottom cancels with this factor there and we're left with net torque multiplied by time. Net torque is the difference between the two torques and so the answer is C and we're multiplying it by the time during which the new torque is applied.